While the Environmental Protection Agency ordered Volkswagen to recall nearly 500,000 sedans equipped with software that tricked emissions tests, the carmaker announced on Tuesday that more than 11 million vehicles actually include the so-called defeat device. The car manufacturer on Tuesday released its first statement since the EPA ordered it to recall 482,000 diesel 4-cylinder model year 2009 to 2015 Volkswagen and Audi vehicles, saying the company was working at “full speed” to clarify irregularities concerning software that evades emissions standards for certain pollutants with a range of serious health effects. VW says that while internal investigations have established that the relevant engine management software is also installed in other vehicles with diesel engines, the majority see no effect from the software. However, discrepancies related to the software are present in around 11 million vehicles worldwide. According to the EPA’s recall order, the diesel cars were programmed to sense when emissions were being tested, and to turn on equipment that reduced emissions. However, the effectiveness of these vehicles’ pollution emissions control devices is greatly reduced during all normal driving situations, emitting as much as 40 times the allowed amounts of nitrogen oxide. The EPA’s announcement of the ordered recall on Friday has set off a string of reactions from the car company and others. 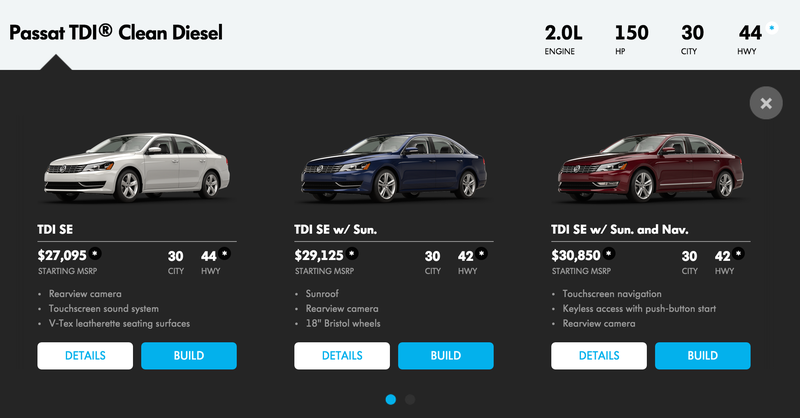 Shortly after the recall was announced, our colleagues at Consumer Reports decided to suspend the “Recommended” ratings it had previously given the Passat diesel and Jetta diesel. On Sunday, the carmaker announced it would stop the sale of all affected vehicle models until the issue was fixed. And on Monday, it was rumored that the Department of Justice is considering bringing criminal charges against VW. According to the Wall Street Journal, the DOJ’s Environment and Natural Resources Division is conducting the probe, though there’s no word yet on exactly what the charges might be. In addition to any future criminal penalties, Volkswagen is facing the possibility of paying upwards of $18 billion in fines for using so-called “defeat device” software. These programs detect when an official emissions test is being performed and then turn on the car’s full emissions control system. Thus, the implication is that the cars are not living up to their “clean diesel” marketing when they are not being tested for emissions. Owners of recalled VWs who feel that they were tricked into buying their vehicles by the company’s “clean diesel” branding can file complaints with the Federal Trade Commission (ftc.gov/complaint or by calling 1-877-382-4357), which handles investigations into false and deceptive marketing.